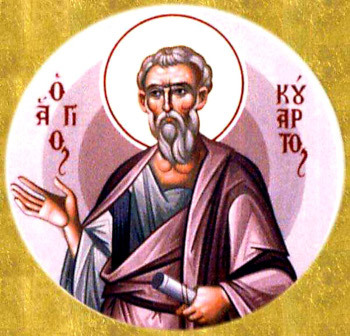 The Holy Disciple from the Seventy, Quadratus, preached the Word of God at Athens and at Magnezia (the eastern peninsula of Thessaly), and was bishop of Athens. He converted many pagans to the true faith in Christ the Saviour. His preaching aroused the hatred of unswayable pagans. One time an angry mob fell upon the disciple to pelt him with stones. Preserved by God, the Disciple Quadratus remained alive, and they threw him into prison, where he died from starvation. His holy body was buried in Magnezia.